This French pair of wrought iron wall lights, has a double bulbs each. This elegant pair of wall lights is a contemporary production and it has an aged finish to look antique. It can be used without lapmshades or with. In the second case, the wall lights become a very decorative objects for their consistent presence. They are perfect to put in evidence an entry or to enhance a simple environment like a kitchen or a corridor. Lampshades (not included) offered as gift. The photos shown the pair of French wall lights present in our gallery. EU wiring 240w 40 watt max USA/GB wiring available on demand and price included. 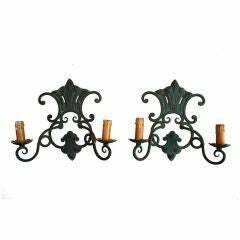 Pair of antique wrought iron sconces with three lights, circa 1900-1910. 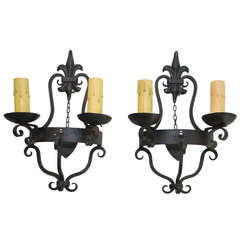 Pair of antique French wrought iron sconces.